Snoring apps are software applications which run on mobile devices like phones, they record sound information while you sleep. These apps for snoring are helpful when you want to stop snoring. Snoring apps are useful for people who want to know if they snore. They are also useful for people who know they snore that want to understand the underlying causes of their snoring. If you are interested in treating your snoring, you will want to use a snoring app. Snoring apps allow you to study your own sleep at home each night. When using a snoring app, you should plug it into a power source, recording all night could drain your battery before the recording as finished. About: SnoreLab includes robust features that visualize snoring at night. With SnoreLab you can add in the factors and remedies which may be causing your snoring. SnoreLab also allows you to email your results with sound and graphs of your snoring each night. Unlike other sleep apps, SnoreLab focuses only on snoring. About: Use the application to record your talk or snoring while you are asleep. The application only records if the noise exceeds sensitivity level due to saving the storage space. You can set the decibel level for the recording to start. The recording will select sections of your sleep which it believes are snoring as individual segments. You can send the individual segments out from the app to email, text of social media. About: Sleeptracker gives detailed analysis of snoring and claims to be 90% accurate. Sleeptracker includes 24 white noise sounds to help you get to sleep. You can see a log book for each night's recording that identifies sections that might have had snoring. This does not show a visualization of the snoring. This is an app mostly for monitoring deep sleep based on vibration of the bed and is not a snoring specific app. About: You can synchronize your snoring data with your Mac or PC using Quit Snoring. About: Records all the noises that occur while you sleep and can record up to 11 hours. What Matters In A Snoring App? There are many different snoring apps on the market in app stores for both iPhone and Android. Each comes with its own specific angle on addressing the snoring problem. Does the app allow recording for more than one night? You will want to track your progress over time. Seeing progress and changes will help you identify what causes your snoring. Does the app allow adding various remedies and factors to each recording session? This is important to track progress of cause and effect (such as alcohol or weight). Also, knowing what you did to reduce snoring, like wearing a mouthpiece. If you cannont store this information in the app, you will need to store it somewhere else and this can make tracking snoring progress more difficult. Does the app easily allow me to share the information it records with medical professionals? Having the ability to send an email with your results can be useful. Export options allow you to quantify the results of your snoring by attributes like duration or intensity of snoring. This can be helpful for understanding why you snore. Will you be able to get the information you want out of the app? Some apps are free but if you are committed to stop snoring, paid apps generally help you accomplish this goal better. Can the app be adjusted to record at different decibel levels? If you sleep in an noisy environment like near a street, you may need to adjust the threshold so that it doesn't falsely think you are snoring. There is currently no snoring app that can distinguish between different people in the room. If you want to use a snoring app, it is best to either have that person be alone in the room or know that the other person or people in the room do not snore. Additionally, snoring apps record all the sound in the room. If you live next to a busy street, the snoring app may detect that you were snoring when in reality, it was noise from traffic outside. You can usually play each clip to hear if the sound was snoring though. Keep in mind however, the best way to use a snoring app is to be in the quietest room possible. Snoring apps do not make recommendations on how to stop snoring. They simply show you how loud your snoring is and when it occurred. This information is very useful when you combine it with information you log related to factors and remedies but realize, a snoring app can only make basic suggestions at best. Another important point to realize is that snoring apps are simply for snoring noise or, possibly also sleep stage. They cannot tell you how much oxygen you are getting while you sleep. For this, you should wear a pulse oximeter (one such device you can wear on your finger is the CONTEC CMS50EA). Knowing how well you are breathing at night could tell you if you have a more serious condition like sleep apnea. Did you do something to reduce snoring? Did you wear a mouthpiece? A snoring mouthpiece can reduce or eliminate snoring (see snoring mouthpiece comparisions here). Did you wear nasal strips? Opening your nose can help reduce snoring. Did you do something to increase snoring? Did you drink alcohol before sleep? Did you eat a heavy meal? You may want to log your weight each night. 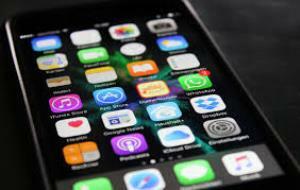 It is possible, if you have more than one phone, to record your snoring with multiple apps at the same time each night. The benefit in this would be to get information in one app and relate it to another. A perfect example of this would be using a snoring app like SnoreLab and then a sleep stage tracking app like SleepTracker 24/7. If you did this, you would know great detail about your snoring and how it relates to your sleep cycle and even your overall health. 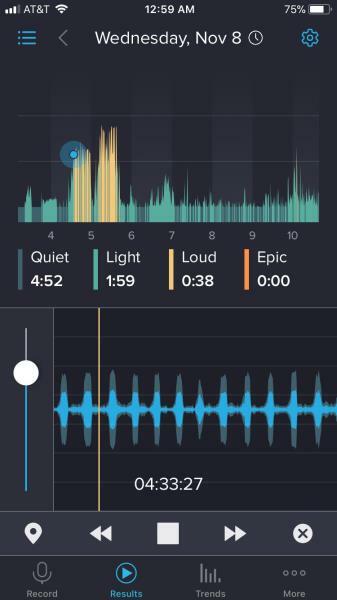 From the apps we have experienced, SnoreLab is the best app for recording snoring at night. It has visualizations of each night and gives you a snore score. This is a useful way to see if you snore at night. Snoring can occur briefly or the whole night, SnoreLab can clearly show you when and how loud you are snoring. SnoreLab is the most expensive snoring app that we have reviewed or seen on the market. This price is not high for anyone who is committed to know if they snore but it should be pointed out that it is expensive as far as apps go.